There is no other city on earth that sits on seven hills with a religious leader that is visited by all world leaders, including the President of the United States of America. And the will of the one they’re bringing forth is the catholic church, the pope. This was made manifest to the world by the news media in the Reagan administration. He would call the pope like twice a week to get his orders, to get guidance from the pope. The House of Yahweh goes before Yahweh once a week to get guidance and then three times a year at the Feasts. The world leaders go before their guiding power twice a week by telephone. And then they visit him in person behind closed doors to get what they don’t want anyone to be able to pick up by phone tapping. The Pope now is guiding all the nations that are in conjunction with the Quartet, as is shown in the Inspired Scriptures. The holder of those Keys authorizes a living network of representatives to speak directly for him. He dispatches his own on-the-spot spokesmen abroad to act for him in at least ninety countries. What captures the unwavering attention of the secular leaders of the world in this remarkable network of the Roman Catholic Church is precisely the fact that it places at the personal disposal of the Pope a supranational, supra-continental, supra-trade-bloc structure that is so built and oriented that if tomorrow or next week, by a sudden miracle, a one-world government were established, the Church would not have to undergo any essential structural change in order to retain its dominant position and to further its global aims. The most important facts and details about the Roman Church from the point of view of any secular power holder, however, all come down to one point. There is a tacit agreement among the great international political and financial leaders that the very attributes that give the Holy See its georeligious power and capability provide it, as well, with everything essential for the same power and capability on the political plane. In secular eyes, the Roman Church stands alone in every practical sense—and not merely among religious and ethical structures and groups—as the first fully realized, fully practicing and totally independent geopolitical force in the current world arena. And the Pope, as the sole legitimate head of the Holy See’s organizational institution and structures—as the only one who fixes the overall goal of that institution’s efforts—is by definition the world’s first fully fledged geopolitical leader. The following excerpted Dateline interview by Stone Phillips with Carl Bernstein is about the power of the Pope. Phillips: The Pope – how many divisions has he got? Soviet Dictator, Joseph Stalin, poking fun at the fact that as one of the world’s most powerful men doesn’t have a single soldier to command. And yet according to a new book, it was a Pope, Pope John Paul II, who helped trigger the collapse of the Soviet Empire. Tonight the exclusive story of how a Pope, a President and a spy secretly conspired to wage and win the cold war. Bernstein: We now have the missing pieces of the puzzle of how communism fell, because the Pope’s role has always been what is missing. This is a man who has marked his time. He has marked our era. It’s a portrait of Pope John Paul II you’ve never seen before, perhaps never even imagined. A religious leader playing a pivotal role in the political struggle of the century, and who’s painting the portrait may surprise you too. Bernstein: The great story of our time is the fall of communism and the central player who hastened the demise of the fall of communism is this Pope from Poland. Pulitzer Prize winning, Watergate reporter Carl Bernstein says what he and co-author Marco Politi discovered and detailed in their new book about the Pope surprised even him. Bernstein: If anybody would have told me ten years ago that I would be sitting here across from you and saying that the Pope of Rome was one of the most important figures of the second part of the twentieth century, I’d say you’re smoking something. This is astonishing. What’s astonishing is what Bernstein calls an intelligence shuttle that developed between the Pope, President Reagan and the C.I.A. Some of the world’s most sensitive secrets shared in a holy alliance that would topple communism and win the cold war. It all started before Ronald Reagan was even elected, as he watched the first Papal visit to Warsaw ever allowed in four decades of communist rule, Reagan would tell a close aide that Poland is where the Iron Curtain would crack. When Ronald Reagan took office in 1981, the Solidarity Movement which would mount unprecedented challenges to the repressive communist regime in Poland was still in its infancy. Bernstein said Reagan made a private pledge to step up secret U.S. aide to Solidarity, eventually totaling some 50 million dollars, but there was more. Reagan also offered the Pope a series of secret briefings by William Casey, head of the C.I.A., a devout Catholic, who briefed then prayed with the Pope. Phillips: It sounds extraordinary. 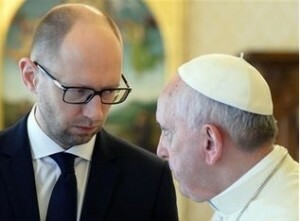 The Pope conferring with a U.S. spy master. Phillips: Where did these meetings take place? Bernstein: In the Pope’s private office, the Pope on one side in a high back chair, Casey across from him. Phillips: And presumably Casey brought a briefcase. Bernstein: He brought a briefcase and on one occasion he brought an envelope and in that envelope was a photograph of the Pope in Victory Square, a tiny little figure in white photographed by a spy satellite from above. It was the first of many often far more sensitive spy photos the Pope was to see. Bernstein said there were as many as fifteen secret sessions between the Pope and Director Casey or former Deputy C.I.A. Director Bernard Walters. Some of Walter’s meetings were summarized in secret cables Bernstein obtained through the Freedom of Information Act. Phillips: Seems clear that the U.S. was sharing intelligence with the Pope. Is it equally clear that he was sharing intelligence with the C.I.A.? Bernstein: Absolutely, he was sharing his judgments on Poland. They gave each other information. All of the analysis of the C.I.A. went to the Pope. All of the Pope’s analysis went to the C.I.A. and the White House. Richard Allen was President Reagan’s first National Security Advisor. Allen: This did, in my judgment, constitute the most important secret alliance of all time. Remember in overwhelmingly Catholic Poland the leaders of Solidarity were also ardent churchgoers, and Bernstein says the Pope with constant reports from the church in his homeland was able to funnel valuable information and advice to the United States about how to encourage the freedom movement without triggering a Russian invasion like Hungary in 1956 or Czechoslovakia in 1968. Allen: The Pope did have something that we don’t have, namely an intelligence system that works. It’s designed to provide intelligence from the local parishes to the bishops and the bishops report to Rome. Although Bernstein stopped short of saying there were direct trade-offs, he says evidence strongly suggests that the Pope did favors for the United States and the Reagan Administration reciprocated. Another secret cable quote: I then passed on to the SS-20 Briefing and the whole nuclear question. Phillips: A C.I.A. briefing on nuclear weapons for the Pope? Bernstein: Yes, showing him satellite photographs of Soviet ballistic missiles. Bernstein says the U.S. urged the Pope not to speak out against Reagan’s Star Wars Defense Plan or cruise missiles in Europe. After the briefings, the Pope stayed silent, and Bernstein says ordered a Vatican report critical of Star Wars buried. And the favor for the Vatican? Bernstein writes the U.S. cut off money for family planning organizations worldwide in deference to the Pope. What’s more, in Latin America, Bernstein reports the C.I.A. was spying on rebel priests and turning the information from wiretaps and electronic eavesdropping over to the Church. Bernstein: Nothing like this had ever happened in the history of even the Church or the United States. Anyone who pays any attention to the world news today can see plainly that the catholic church reigns over the leaders of the earth. Notice the following news excerpts. These are just a few of the many leaders who have met with the pope recently. The two men greeted each other with a smile and a handshake and posed for pictures before sitting down across a table from each other. They spoke privately for nearly an hour. Israeli Prime Minister Benjamin Netanyahu and Pope Francis exchanged gifts during a 25-minute meeting at the Vatican on Monday. VATICAN CITY (Catholic Online) – On Monday afternoon, November 25, 2013, Pope Francis met President Putin in the Vatican. Pope Francis received King Abdullah II of Jordan in audience at the Domus Sanctae Marthae on the afternoon of April 7. The Pontiff will celebrate Mass at a stadium in Amman, Jordan’s capital, at the beginning of his three-day apostolic journey to the Holy Land in May. Pope Francis met on April 24 with Prime Minister Edi Rama of Albania. A brief Vatican statement released after the meeting indicated that the Pontiff had spoken with the Albanian leader about Church-state relations, inter-religious dialogue, the Church’s contributions to Albanian society, and the country’s plans for entry into the European Union. During the cordial discussions, emphasis was placed on the good relations between the Holy See and Liberia, and satisfaction was expressed regarding the positive progress made in strengthening the country’s democratic structures. Visiting UN High Representative for the Alliance of Civilizations HE Nassir bin Abdulaziz al-Nasser has met Pope Francis here. The overall situation in the Middle East, particularly the humanitarian situation in Syria, the Palestinian issue and the Ukrainian crisis, in addition to a number of international humanitarian issues of common interest were also discussed during the meeting. King Juan Carlos and Queen Sofia looked thrilled to be meeting the religious leader for the first time. After the canonisation mass, the Spanish King was the first to be greeted by the Pope with a handshake. Queen Sofia then showed her respects by kissing the Pope’s ring, a symbol of his pontifical power. The couple spoke briefly with the Pope and will be treated to a private audience with the pontiff and his secretary of state Pietro Parolin on Monday morning. The private audience with Pope Francis was the first meeting between the 87-year-old queen, who is Supreme Governor of the Church of England, and Pope Francis, head of the Roman Catholic Church. “If you look back in terms of Queen Elizabeth’s reign, it is extraordinary how far the relationship between Britain and the Holy See, and between the Anglican Church and the Catholic Church, has developed since 1952 when she became queen,” he said. A key aspect of that has been her several encounters with different popes over the years, Baker said. Plagues and burning are prophesied to take place, also in this generation, as a result of the leadership; that is, sinful leadership of the roman catholic church. The Savior said you will see these things. Look, they are here. This same city is spoken of also in Revelation Chapter 18 of The Book of Yahweh, which shows a great nuclear burning that takes place. The Savior, Yahshua Messiah, Whose Name was removed from the Inspired Writings of His Disciples by the roman catholic church and replaced with the names of two Gods, spoke of this generation of nuclear burning that will actually darken the sun. This Prophecy is remarkable because it shows the nuclear burning will take place in this present generation, called the Last Days or The End as some render the Hebrew and Greek words. The knowledge of splitting the atom and the computing of knowledge that led to the building of the nuclear bomb that can darken the sun stated in 1934. At the end, the very end of this generation, the nuclear burning and the darkening of the sun will take place. So, the last thing we will see in this present generation is the great nuclear bombs used that will darken the sun and put an end to the cause of all the plagues that we see in this generation that are growing worse with each passing day. Notice the plagues. (NaturalNews) It has long been recognized by intelligent observers that a global superbug pandemic is inevitable. Drug-resistant superbugs like MERS (Middle East Respiratory Syndrome) are 100% immune to every conventional medical treatment in existence. There is no antibiotic, no vaccine, no drug and no treatment practiced by western medicine that can stop these bugs… and infections are deadly. Now we’ve learned they’re spreading out of control in Saudi Arabia, following an explosive pandemic pattern that has infectious disease experts sounding the alarm. An alarming 140 cases have been found in April alone, and more MERS cases have been reported so far in 2014 than during the entire year of 2013. According to data analysis by MacKay, healthcare workers are also being infected and an astonishing 7% are dying from those infections. When healthcare workers are infected, they tend to increase the spread of the disease by inadvertently infecting patients. State television said Saturday that the country’s first case had been discovered. It said the patient, who was hospitalized in Cairo, had recently traveled to Saudi Arabia, where the virus was first identified. So now we have the first documented case of MERS crossing borders and becoming an international superbug. Don’t close your eyes yet! ATLANTA, April 25 (UPI) — For the week ending April 19, overall U.S. flu activity was down except in Texas, the New England, New York and New Jersey where influenza B predominated. Influenza B viruses accounted for 56 percent of flu viruses nationally and are causing an increase in influenza-like-illness in parts of the Northeast, the report said. Measles is a highly contagious respiratory disease that generally affects young children, causing fever, a runny nose, a cough and a distinctive rash all over the body. About one in 10 children also gets an ear infection and one in 20 comes down with pneumonia. A person with measles is contagious as long as four days before the symptoms are apparent, Schuchat said. And they are born with plagues now? Look again. June 1, 2004 — A World Health Organization study released Tuesday shows that rates of most mental illness are far higher in the U.S. than in any other country in the world. Despite evidence that one in four U.S. adults experiences mental illness at some point, researchers still consider the figure an underestimate. They acknowledge that many people remain reluctant to tell surveyors about their mental health history, mainly because of the stigma attached to mental diseases. “These numbers are absolutely staggering,” says Ronald C. Kessler, PhD, a professor of health care policy at Harvard Medical School in Boston, and one of the study’s co-researchers. … schizophrenia, one of the most common mental diseases on earth, affecting about 1 percent of humanity. The facts of schizophrenia are so peculiar, in fact, that they have led Torrey and a growing number of other scientists to abandon the traditional explanations of the disease and embrace a startling alternative. Schizophrenia, they say, does not begin as a psychological disease. Schizophrenia begins with an infection. The idea has sparked skepticism, but after decades of hunting, Torrey and his colleagues think they have finally found the infectious agent. You might call it an insanity virus. If Torrey is right, the culprit that triggers a lifetime of hallucinations—that tore apart the lives of writer Jack Kerouac, mathematician John Nash, and millions of others—is a virus that all of us carry in our bodies. The implications are enormous. Torrey, Meyer, and others hold out hope that they can address the root cause of schizophrenia, perhaps even decades before the delusions begin. Yahweh’s Prophets show the cause. There is a cause for every effect, and the cause of these plagues have been adding up in our bodies for 6,000 years. Call, write or email us for information on the microorganisms that make your body live and the microorganisms that make your body die. Yahweh said to Adam, don’t follow the evil of the Gods or dying you will die. That was in the first generation. The Last Generation shown in Prophecy shows Satan has deceived the whole world. Eve was deceived in this first generation. The two previous verses, coupled with Genesis 3:5, show that Satan deceived the whole world into worshipping Gods by practicing the evil that the Gods practice. The Book of Revelation shows that the roman catholic church has been instrumental in this teaching, and in fact, she belongs to Satan. Notice in your own bible and also read it from The Book of Yahweh below. The King James Version uses the word God in verse 10 instead of Yahweh. Why? Because the roman catholic church removed the Name of the Creator, Yahweh, and the Name of the Savior, Yahshua, and replaced them with the titles of Lord and God. They also chose the names of two Gods of Egypt with which to replace the Name of the Savior, Yahshua Messiah. When the Name of the Creator, Yahweh, is restored, a large percentage of deception is wiped out, because Yahweh was not identified as a God by the Inspired Prophets. Those who practice sin will not enter Eternal Life. Through all of the above, Satan has deceived the whole world. From that deception, hatred and iniquity have abounded in this generation. The whole world has accepted the evil of the Gods (Genesis 3:5); thus, comes the lack of love. As one can see, every religious leader is a false prophet who brings forth the evil of God worship. No love; that is, no True Love. Doing away with Yahweh’s Laws and Prophecies is exactly what the roman catholic church did with their roman army. The daily teachings of the Laws and the Prophets was an every day thing that ended when the pharisees, sadducees, essenes, and herodians had their roman army destroy the House of Yahweh called temple at that time by the pharisees, sadducees, essenes, and herodians because they did not want to use Yahweh’s Name or worship Yahweh. They did not want to practice Righteousness. They moved to Rome, destroyed the temple, and ended the daily reading of the Laws and Prophets. The Book of Yahweh was forbidden with death penalty. See history of the bible. For more than 1,500 years The Book of Yahweh was forbidden. After many deaths, they permitted it to be printed and sold under the guise of the King James bible. See history of the bible or read our Book of Yahweh Brochure. But Righteousness was removed from all people for over 1,500 years. The Book of Yahweh did not come back into existence until this present, prophesied generation. At which time, we see clearly the results of sin in the health of all people. Breaking Yahweh’s Health Laws or teaching the nations to do so, causes sickness and disease epidemics, which cause confusion to one’s mind. Remember that word confusion. The Book of Yahweh shows health Laws that would wipe out sickness and disease if all people would start keeping those Laws. They include Laws that guide one in the practice of safe, pleasant, Holy, Righteous, protective sexual activities. Take a minute to read this most valuable information that the nations refuse to teach. They even make it illegal to teach in schools and other public places. This generation follows the priest who eats swine, which is pig–pork, ham, bacon. Why didn’t someone tell me that pork (swine) is unhealthy? Regardless of your spiritual beliefs, there may be good reason to carefully consider your decision to include pork as a regular part of your diet, because despite advertising campaigns trying to paint pork as a “healthy” alternative to beef, research suggests it may be hazardous to your health on multiple levels. One of the most potentially acute hazards is contamination with pathogenic bacteria. Remember the world, for lack of Righteous knowledge for 1,500 years, follows the priest who eats swine and worship the dead. Eating pork is harmful to health in a great many regards. This harm still persists today, despite all the precautions that are taken. First and foremost, no matter how clean the farms and environments on which it is raised may be, the pig is not by nature a clean-living animal. It often plays in, and even eats, its own excrement. It has been scientifically proven that these significant amounts of antibodies, hormones, cholesterol and lipids in pork represent a serious threat to human health. Another harmful substance in pork is the “trichina” worm. This is frequently found in pork and when it enters the human body, it settles directly in the muscles of the heart and represents a possibly fatal threat. Did Leviticus get it right? Pork may still be dangerous. Indeed, there is an association between pork consumption and the primary liver cancer, hepatocellular carcinoma. The correlation with pork consumption is as strong as that for alcohol. Beef has no relation at all liver cancer. There is big money in the pork industry. Plus, sickness, from whatever the source, brings in the sale of drugs. Remember, the love of money is a root of all evil. Evil? Do evil and you will be like the Gods (Genesis 3:5), but you will not be like Yahweh. Be like Yahweh? Yes, that’s why man was created. And you will not be given Eternal Life. Eternal Life is only given to those who keep Yahweh’s Laws, letting Yahweh make them in His Image and Likeness. 5 The deer, the gazelle, the roe deer, the wild goat, the mountain goat, the antelope, and the mountain sheep. 6 And you may eat every animal that has a split hoof completely divided, and that also chews the cud. 7 However, of those that chew the cud or of those that have a split hoof completely divided, you may not eat these: the camel, the rabbit, or the coney. Although they chew the cud, they do not have a split hoof, they are unclean for you. 8 And the swine; the pig, is unclean for you; although it has a split hoof, it does not chew the cud. You must not eat their meat, nor touch their carcasses. The word abomination comes from a Hebrew word that means sickness or sick. Abominable means that you can pass your sickness on to your children as an hereditary disease, some of which can manifest as physical/mental birth defects. Birth defects carry a multitude of abominations and abominable means along with STDs, cancer, heart, lung and kidney problems. Abomination also means birth defects. Birth defects are passed fro father to son or daughter or from mother to son or daughter. The condition, called gastroschisis, is most common in babies whose mothers are under age 20, occurring at a rate of 1 in 575 births. It’s a preliminary finding regarding a mysterious birth defect that appears to be increasing worldwide, including in Utah, she said. In most cases, the small and sometimes large intestines are outside the abdomen. Sometimes all or part of the stomach is, too. More rarely, ovaries, fallopian tube or testes are. It’s just slightly more common in boy babies. “We found that women who reported both urinary tract infection and STD one month prior to conception through the first trimester were far more likely” to have babies with gastroschisis, which occurs in the first trimester. Feldkamp said the link may be even stronger, because they may be “missing women who have infection who we are calling unexposed.” That’s particularly true of chlamydia, a common STD that often has no symptoms and so goes undiagnosed. It was the most commonly identified STD in the study, she said. Congenital infections affect babies as the result of infection of the mother during pregnancy. Infection of the infant can occur before the infant is born or during the birth process. Bacteria, parasites, or viruses can cause congenital infections, which are infections that are present at birth. These infections can be passed to the fetus or newborn in two ways. Some infections, such as rubella or cyto-megalovirus, are passed from the mother to the baby through the placenta, the organ that nourishes the baby in the uterus, or womb. A baby can also become infected during the passage through the birth canal, as happens with group B streptococcus. If you are infected with chlamydia, a lot of the signs are unnoticeable. Some consequences to the unborn child or newborn are premature birth, infant pneumonia and neonatal eye infections. Gonorrhea is another disease that is somewhat silent, but when symptoms do appear they are often mild. Gonorrhea can cause blindness, menigitis, and septic arthritis during the delivery of the newborn. Hepatitis, another serious disease… Problems for the unborn child or newborn are the same for the infected person. Genital herpes is spread by skin to skin contact on the infected site. Usually if a woman is infected at the time of the delivery, she will have a cesarean birth to avoid causing an infection to the newborn which can cause possible death or brain damage. AIDS, a very serious disease… Newborns usually develop the AIDS virus within one year after their birth. Syphilis, another horrible disease which can be contacted through open sores, and through sexual encounters or experiences. If a pregnant mother is left untreated, she will normally pass this disease onto her unborn child. The consequences to this can result in damage to the infant’s heart, brain, eyes and will cause stillbirth and death. With this information, why would anyone eat pork or any other unclean animal, sea creature, or insect? Why would anyone practice prohibited sexual acts found in Leviticus 18? The answer is, they follow the priest who eats swine’s flesh and promotes illicit sexual acts, the head of the roman catholic church that sits on seven hills and leads the leaders (kings) of the earth. Notice the following information. Since April 6, 1964, the Holy See has been a permanent observer state at the United Nations. In that capacity, the Holy See has since had a standing invitation to attend all the sessions of the General Assembly, the United Nations Security Council, and the United Nations Economic and Social Council to observe their work, and to maintain a permanent observer mission at the UN headquarters in New York. Accordingly, the Holy See has established a Permanent Observer Mission in New York and has sent representatives to all open meetings of the General Assembly and of its Main Committees. As a matter of diplomatic courtesy, since 1964, the Holy See was also allowed to make formal policy statements in the General Assembly, both during the General Debates and during the discussion of the various separate issues contained in the agenda of the General Assembly. Notably, Popes Paul VI, John Paul II, and Benedict XVI were invited to address the General Assembly. In addition, the Holy See was invited to observe all open meetings of the intergovernmental subsidiary bodies of the General Assembly. The Holy See was frequently allowed to participate in the private negotiations leading to the adoption of the General Assembly’s decisions and resolutions. The Holy See was not allowed, however, to co-sponsor draft decisions or resolutions, to make points of order or to exercise the right of reply. If the Holy See wished to circulate written proposals or position papers, it required the assistance of a member state that was willing to present those proposals or papers as its own. The Holy See took advantage the prerogatives of its observer status to incorporate its interpretation of Christian values within the decisions and recommendations of the United Nations. In 2004, the UN General Assembly confirmed the Vatican’s status as a Permanent Observer. Currently, the Holy See has the right to participate in the general debate of the General Assembly and to intervene in the discussion of any issue inscribed in the agenda of that assembly. It has the right to participate in all meetings open to all Member States, the right to make points of order and to exercise the right of reply, the right to circulate proposals and position papers as official documents, and the right to co-sponsor draft resolutions and decisions. Why is the priest who sits on the seven hills of Rome the only priest allowed this status? This shows clearly the leading position the pope is given among the world leaders, and proves Revelation 17:5, 18 exclusively correct, though written 1,918 years ago. Yes, around 96 ACE. Now notice the abominations this religion that sits on seven hills brings forth. …sentence of the great whore that sits upon many waters. The Prophet Isayah shows us clearly the priest the world is following today shown also in Revelation. The roman catholic church sits on seven hills–the seven hills of Rome. The roman catholic church priest? The roman catholic church teaches the whole world to practice halloween–the worship of the dead. Their priests eat pork and teach the people to eat pork and rodents, both are sins and iniquity. According to the Greek dictionary in Strong’s Exhaustive Concordance, the word iniquity is word #458 from word #459, and means: not subject to the Laws; that is, doing away with the Laws. Following the priest who eats pork and worships dead Gods in bringing plagues of sickness and disease that are getting worse daily. Dr. Arjun Srinivasan, the Associtate Director of CDC, told PBS Frontline. Seems horrible, but it’s not the worst! But there is the final plague, which is very near, called nuclear consumption that is prophesied to take place in this generation. Revelation 17:1…I will show you the sentence of the great whore that rules over multitudes, nations, and languages (Revelation 17:15). There is a cause for every effect; a curse does not come without a cause. The cause is the increase in sin due to rebellious false priest who show their rebellion by eating pork and changing Yahweh’s Laws of Righteousness; teaching the evil of God worship, which brings confusion to the whole world. Who are these priests? Compare the following. The roman catholic church and her daughters, whose preachers fear bringing any Truth, are near to perishing. We are in the Last Generation. We see all of these things, including the abounding of iniquity, the extreme hatred among the nations, and the nuclear bombs invented in this generation. This generation started in 1934. We are in the last part of the Last Generation given to prove what rebellion brings. The final prediction is at hand. What to do. You need to first come out of her. Did you notice verse 10? The End is close. It will all end in this generation. Do you not know? The answer is: the world does not know because the roman catholic church removed the Book of Yahweh from the whole world. Under fear of the roman catholic church, the religious corporations shun preaching Yahweh’s Righteousness and the mere mention of His Name. Yet, therein lies Salvation. The nuclear wars could start very soon now. Remember, there is a place of safety. We await to help you. Marijuana? America, Why Are You So Quick To Do Evil?